Home > Sheep > Wool market bouncing along. 04 Apr Wool market bouncing along. 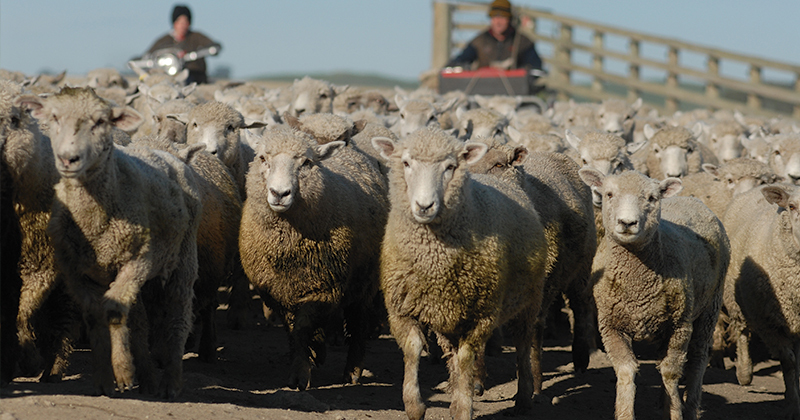 The pattern of the wool market rising one week and falling the next continued. This week saw the market continue the weak finish to last week’s sales and post a week of price corrections. The Eastern Market Indicator (EMI) gave up 6 cents to 1772 cents, while in US$ terms the EMI lost 3 cents to 1364 (Figure 1). This US$ level for the EMI is the lowest the market has traded for this year, an indication that unlimited demand and price rallies are no more the case now than they were ever. It now appears that the market may have found a top (in technical or charting terms) in January, and with reports of tightening Chinese credit terms we could be lining up for weaker demand and lower prices in 2018. The AU$ played its part and lost favour during the week, easing again by 0.5 cents to US$0.77, which softened the fall in the general market indicators. The West fared better, due to the later selling last week the market had already pulled back, in fact the Western Market Indicator (WMI) gained 2-cents to 1869 cents. 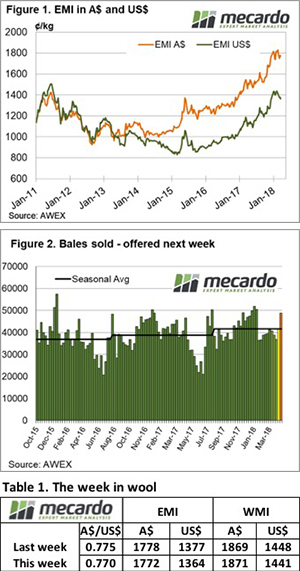 There was an interesting spectrum to the market this week; the crossbred section posted another week of increases, and due to the greater volume of crossbred wool in the Melbourne catalogue the Southern Indicator held steady. Crossbred types for the second week in a row rallied between 10 and 20 cents. Merino skirtings performed stronger than the fleece types although generally slightly lower for the week. Merino Cardings had another good week, posting around a 24-cent improvement across the three cardings indicators. The past three weeks has seen the Pass-in rate fluctuate with 9%, 4.0% and this week 7.8% passed by growers as they react to the variable market week-on-week. Generally this rate has fluctuated in line with market movements week on week. There was an increased clearance this week of 41,334 bales, almost 5,000 bales more than last week. Next week is the Easter break, with sales resuming the week beginning 9th April. On resumption, almost 49,000 bales are offered, which will test the resilience of the market. AWEX report that volumes are predicted to decline after this sale.